DASH is a whitening process that lightens discoloration of enamel and dentin. Will DASH work for me? Dash whitening achieves the best results on yellow and brown tooth stains. Teeth with gray shading caused by tetracycline or other medications may respond to Dash treatment; however, whitening may be less effective on this kind of discoloration. Keep in mind that crowns and other tooth-colored restorations will not whiten. To avoid a technicolor effect and maintain uniform color, tooth-colored restorations may require replacement after the whitening procedure. Our highly trained staff will help you decide if DASH is the most effective whitening treatment for you. Is whitening my teeth with DASH safe? Yes, research and clinical studies indicate that whitening teeth under the supervision of a dentist is safe. In fact, many dentists consider whitening the safest cosmetic dental procedure available. As with any tooth whitening product, DASH is not recommended for children under 18 years of age and pregnant or lactating women. The DASH light-activated whitening gel’s active ingredient is Hydrogen Peroxide. As Hydrogen Peroxide is broken down, oxygen enters the enamel and dentin, whitening any colored substance while keeping the structure of the tooth unchanged. The light aids in activating the Hydrogen Peroxide and helps it penetrate the surface of the tooth. DASH also contains amorphous calcium phosphate (ACP), potassium nitrate and flouride, ingredients proven to be beneficial to teeth and for relieving sensitivity. The entire procedure takes just over one hour. The procedure begins with a preparation period followed by one hour of whitening. Is the DASH in-office procedure painful? No. During the procedure, you can relax while laying back. By following some simple post whitening care instructions, your teeth will be lighter than they were before. We recommend flossing and brushing twice daily. Why is DASH better than other whiteners? Over-the-counter tooth whitening strips, brush-on gels and toothpastes take weeks or months to whiten your teeth just a few shades. 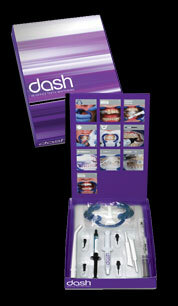 DASH is clinically proven to whiten your teeth eight shades in one hour. Some people experience temporary increased tooth sensitivity to cold during treatment. These symptoms disappear within 1-3 days after completion of the treatment. What is Philips Zoom! Nite White whitening? In case of a whitening emergency. NiteWhite Quick 3-Day is the way to go. You’ll get a noticeably brighter smile at home in just a few days. It’s perfect for those last minute situations when a healthy white smile is mandatory. How does Philips Zoom! Nite White work? The dual barrel syringe features two chambers – the first separates a powerful and stabilized Carbamide Peroxide formula; the second chamber contains an activation gel with soothers, conditioners and desensitizers added. The gel is activiated through its auto-mixing nozzle precisely at the time of use for tooth whitening. Nite White uses a tray based system, so you will need a custom fitted tray to use this product (available at your local dentist). The procedure is just 3 quick overnights or 3 2-4 hours a day. Some users might feel sensitivity with nite whitening. The sensitivity is caused by fluxing of O2&HCO2 ions through the dentinal tubules. If you are prone to sensitivity it is recommended to use a sensitivity toothpaste, like Sensodyne, for a week or two before you start whitening with Nite White. The other option is to use a desensitizing gel after whitening. What are Crest 3D White Professional Effects Whitestrips and how do they work? 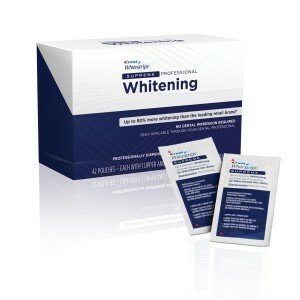 Get professional teeth whitening effects right at home with the Crest 3DWhite Professional Effects Whitestrips. Crest 3D White Professional Effect Whitestrips are thin, flexible strips that are coated with a tooth whitening gel. Designed to conform to the shape of your teeth, they work by keeping the teeth whitening gel in place against your teeth to remove stains below the enamel surface. Whitestrips use the same, effective whitening ingredient dentists use. You can even drink water and even talk in them thanks to the Advanced Seal technology. Translation: They deliver the whitening you need where you need it for a brighter, whiter smile! How long will Crest 3D White Professional Effect Whitestrips take ? Just use them for 30 minutes a day for 14 days, and you will start to see results after 3 days and great results after only 7 days! Can Crest 3D White Professional Effects Whitestrips damage my teeth? No! 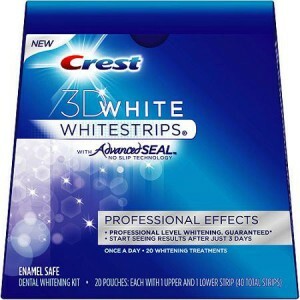 Crest 3D White Professional Effects Whitestrips remove stains and yellowing but nothing else. When used as directed, it’s a safe and effective addition to your beauty routine. Our Whitestrips contain the same enamel-safe teeth whitening ingredient as dentists use to whiten teeth, so you can be confident that they’re safe. What are Crest Supreme Professional Whitening Whitestrips and how do they work? Get professional teeth whitening effects right at home with the Crest Supreme Professional Whitening Whitestrips. Crest SupremeProfessional Whitening Whitestrips are thin, flexible strips that are coated with a tooth whitening gel. Designed to conform to the shape of your teeth, they work by keeping the teeth whitening gel in place against your teeth to remove stains below the enamel surface. Whitestrips use the same, effective whitening ingredient dentists use. How long will Crest Supreme Professional Whitening Whitestrips take ? Just use them for 30 minutes twice a day for 21 days, and you will start to see results after 7 days. Can Crest Supreme Professional Whitening Whitestrips damage my teeth? No! Crest Supreme Professional Whitening Whitestrips remove stains and yellowing but nothing else. When used as directed, it’s a safe and effective addition to your beauty routine. Our Whitestrips contain the same enamel-safe teeth whitening ingredient as dentists use to whiten teeth, so you can be confident that they’re safe.